A great fight is a perfect storm. Put two fighters together and you never know what you’ll get, but when both have the intention of making a statement against each other and the styles mesh, it becomes something more than just an athletic competition. When that happens, there’s nothing better in all of sports. Here are five of the best fights from the first six months of 2015. Corey Anderson’s first pro loss was a painful one, mainly due to the teeth he had to get fixed after eating a knee from Gian Villante, but someday he may look at the third-round knockout defeat as the turning point in his career, because he proved that he didn’t just have the talent to succeed, but the heart as well. This was a dig down deep bout, and both Anderson and Villante did that throughout, with Long Island’s Villante - down on one scorecard heading into the final round and even on the other two – leaving the judges out of it with a sudden third-round finish. It’s almost hard to believe that Nik Lentz had a reputation as a grind ‘em out wrestler that doesn’t engage in crowd pleasing brawls. Well, there’s something about Charles Oliveira that brings out the best in “The Carny,” and while their first bout in 2011 was good, this second one in May was even better, and this time, there was no controversial no contest result, as Oliveira broke a close fight open in the final round and submitted Lentz via guillotine choke. In boxing, you rarely see two hot prospects meeting on the way up. It just doesn’t happen. In the UFC though, a great matchup is a great matchup, and Sean Shelby put together a classic one between featherweights Yair Rodriguez and Charles Rosa at UFC 188 last month and they stole the show with a mix of flashy striking, slick groundwork and guts and grit. When it was over, Rodriguez emerged with a well-deserved decision win, and it’s not out of the realm of possibility that the next time they meet will be with a world title up for grabs. Great MMA fights rarely have every element of the sport flowing through it from start to finish. Brian Ortega’s third-round stoppage of Thiago Tavares was the exception. From slick groundwork to crisp stand-up exchanges, from two guys going for the finish throughout to gut checks for both featherweights, this was a fun one to watch, and in beating the veteran Tavares, Ortega announced his arrival to the big show in a big way in his second Octagon bout, and it’s clear that we will be hearing a lot from “T-City” in the future. I don’t know whether I love this fight because it captured the great comeback of Andrei Arlovski in four minutes and 41 seconds or just because two big guys swinging bombs at each other for nearly five minutes will always get the top spot in my heart. 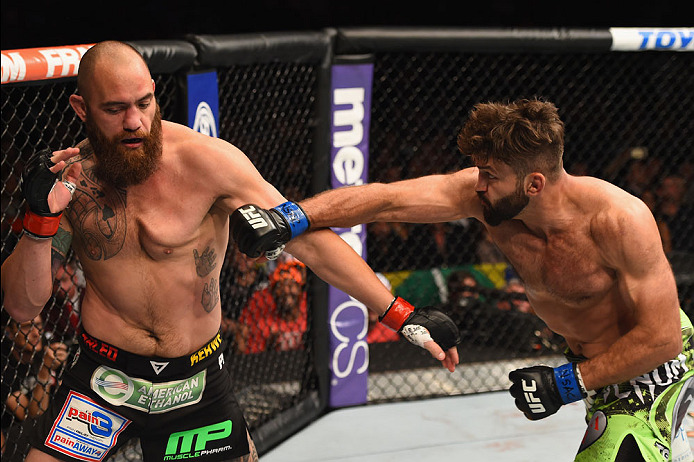 Whatever it is, Arlovski and Browne didn’t fight like good friends on May 23. This was a bitter enemies kind of fight, with Arlovski putting Browne in trouble several times, Browne coming back with a knockdown, and “The Pit Bull” finally putting the finishing touches on his former training partner with a barrage of blows. It was compelling from a storyline point of view and in terms of pure visceral action, and that’s why it’s my highly unofficial pick for UFC Fight of the Half-Year.